Kevin Riley 51 years old, I live in Glen Spey, NY located in Sullivan County. I have been a New York State Licensed fishing guide #3100 since 1998. I am the Owner/Operater of Reel'Em In Guide Service offering Driftboat fishing and Ice Fishing outings. 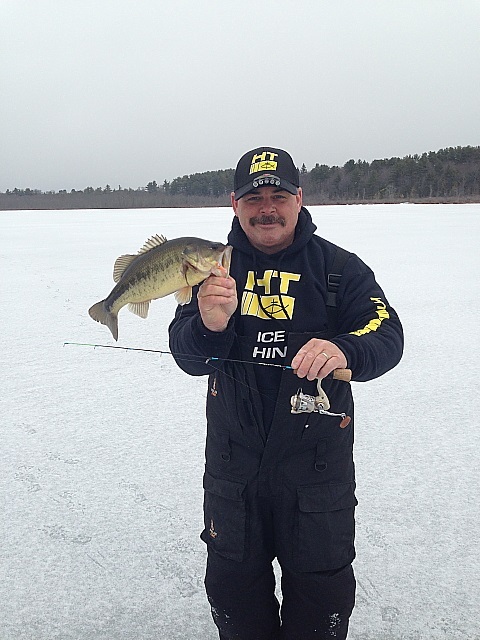 I have been participating in competitive Ice fishing tournaments since 2005. I have fished the Trap Attack, NAIFC, and Mid-West Open Tournament trails. One of my proudest tournament accomplishments was winning the 2007 North American Ice Fishing Championship on Lake Henry/Agnes in Alexandria MN. I look forward to competing in Knutsons 2015 Mid-West Open(with Dave Young), Champlain Valley Hardwater, and Northeast Panfish League tournament trails this season. My favorite rod is an HT Ice Blue Professional IBP-26 UL Ultralight action rod with 2 # test line. My favorite jig is a HT Marmooska Tungsten Diamond Jig MJDIB-12A tipped with Maki-Plastic or a Wax worm. My Favorite sports team is the New York Yankees My hobbies are collecting Vinyl Records and Vintage Bottles. My passion is talking, teaching, and participating in anything regarding the sport of Icefishing!